Digital5 was the Agency-on-Record (AoR) for Tirun Travel Marketing, which is the India Representative of Royal Caribbean International. During the period of our partnership with Tirun, Digital5 strategised and produced all marketing and promotional material for Royal Caribbean Cruises, Celebrity X Cruises, and Azamara Cruises, in India, across all mediums available at that time, including Print, Television, and Direct Marketing. Digital5 also helped set up the social media for Tirun and its three cruise lines in India. The work showcased here is just indicative of the wide range of creatives we produced for Tirun/RCI over 8 years. 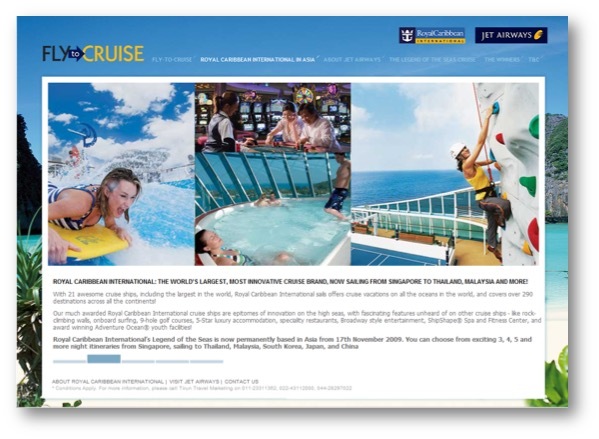 Digital5 helped conceptualise and promote Fly2Cruise – a joint promotion by Jet Airways and Royal Caribbean International. During the period of the contest, Jet Airways flyers were given a chance to win a Royal Caribbean cruise holiday, by simply answering a few questions on board their flight. Digital5 advertised the promotion using flyers and standees at various airports around the country, as well as with a website and online advertising. The promotion was a big hit, and Royal Caribbean gained great exposure to air travelers across India, as well as permission to stay connected with all those who opted to receive more info about cruise vacations.